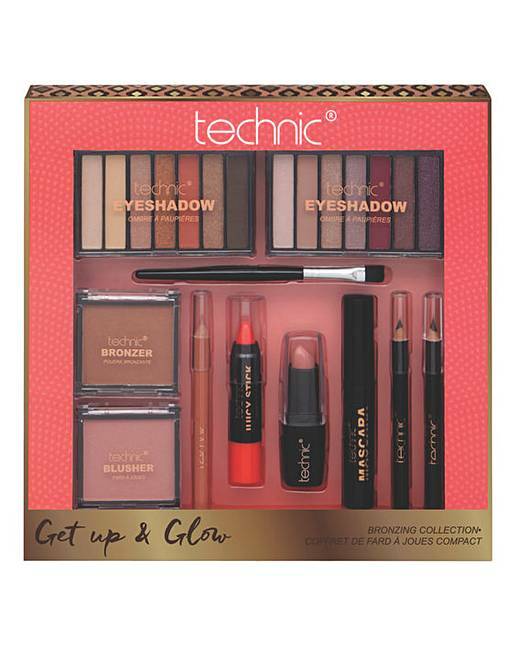 Technic Get Up and Glow Bronzing Kit is rated 5.0 out of 5 by 2. This beautiful bronzing blockbuster helps create that summery glow all year round. With two eyeshadow palettes each with seven warm shades, an eyeliner and a mascara your bronzed eye shadow look has never been so perfect. The lip liner, chubby stick and lipstick will make sure your lips emit pure pout perfection with summery shades, and the warm tones in the blusher and bronzer included will make sure your skin looks sun kissed and bronzed no matter the weather. Set includes: 2x eyeshadow compacts, 1x blusher, 1x bronzer, 1x lipstick, 1x chubby stick, 1x mascara, 1x lip liner, 1x eye liner and 1x eyebrow pencil. Rated 5 out of 5 by sally from Best purchase ever! Bought this a month ago! So glad i did as a bargain for price & all make up i need!